For the first time in this five-Test series, India put together a display worthy of their No. 1 Test ranking. For the first time in this five-Test series, India put together a display worthy of their No. 1 Test ranking as they wrested back the initiative by closing the second day of the third Test with a second-innings lead of 292 runs at Trent Bridge. That they managed to do this without major contribution from Virat Kohli, however, is an encouraging sign as they push for a famous win to keep the series alive. 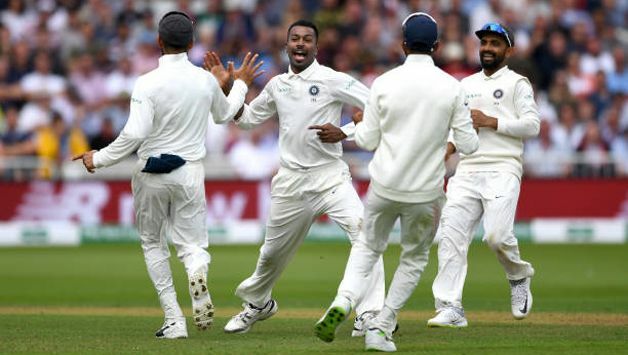 After a wretched time with the bat at Lord’s, India’s batsmen put together a score good enough to challenge an England line-up that didn’t seem to end, although they would have liked a few more runs than the 22 they ended up with for the loss of their last four wickets. 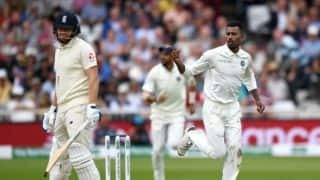 Gloomy overhead conditions saw Stuart Broad swing the ball prodigiously to uproot R Ashwin’s middle stump, and the Indian bowlers’ overzealousness to take wickets saw Alastair Cook and Keaton Jennings help themselves to 46 runs in the nine overs before lunch. But Ishant Sharma, Jasprit Bumrah and Hardik Pandya – who took a career-best 5-28 – combined to bowl England out for 161 inside a session’s play. That the toss has played an important role in the series is no secret. England have won all three tosses in the series so far, but while they read the conditions correctly in the first two instances, Joe Root’s decision to put India in may have been erroneous in hindsight. India, however, walked back into the dressing room with a sense of finally nailing their XI with respect to the conditions. The three changes India made to their team for the third Test have played a significant part in the two days: Shikhar Dhawan returning to score important runs in both innings, and partnering KL Rahul to two 50-plus opening stands, Jasprit Bumrah adding much-needed variety to the bowling attack – extra pace and a unique action – and debutant Rishabh Pant making a terrific first impression with both bat and gloves behind the stumps. However, the day belonged to Pandya, who was cursing himself on his way back to the pavilion when he was dismissed with what was the last ball of the opening day’s play. A few more overs in the middle with Rishabh Pant, and India could have had a bigger total on the board. Michael Holding had questioned Pandya’s place in the Indian team as he wasn’t offering enough with the bat to be holding down the No. 6 spot, nor was he bowling enough overs to cause damage as a serious all-rounder. Despite his shortcomings, Pandya provided some resistance in the last two Tests where better batsmen have perished. But with conditions aiding swing and Mohammed Shami having been taken apart before lunch, the Baroda bowler conjured up a six-over spell that broke the back of the English batting. He removed Joe Root with the first ball of his spell, getting the England captain to fend off a back-of-a-length ball, sharply taken by Rahul in the slips. 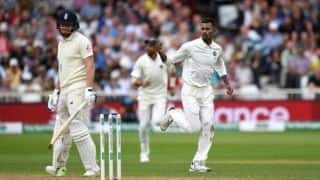 Root’s dismissal – viewed from various angles to see if Rahul’s catch was clean – caused some debate, but the wickets thereafter were taken straight out of a swing bowler’s manual; Pandya swung the ball in a manner James Anderson would have been proud of. Johnny Bairstow was removed before he could launch a counter, Chris Woakes was surprised by a bouncer that Pant grabbed onto sharply, while Adil Rashid and Broad were dismissed with pure swing. Eleven years ago, another swing bowler from Baroda had inspired India to a famous win at the same venue: Zaheer Khan. Pant’s swashbuckling start to his Test career on the first day – he got off the mark in Test cricket with a six – continued with five dismissals behind the stumps. His keeping has been tidy, and some consistent runs at No. 7 could see him edge ahead of senior members in the games that follow. India began their second innings with positive intent, and a second 50-plus opening stand augurs well for the remainder of the series. Rahul may have been undone by sheer pace from Ben Stokes, but Dhawan’s dismissal after jumping out prematurely to Adil Rashid only to be stumped for 44 indicated his eagerness to get to a milestone rather than the larger picture. Pujara’s assured start could also be linked to a strong opening stand, giving India’s batsmen confidence to score runs instead of blocking deliveries for a change. India’s fortunes in Test matches overseas have often suffered due to one of the aspects of their cricket not being executed to its potential; in Birmingham, a few more runs from the rest of the batsmen besides Kohli would have taken India through to victory – not being able to close out games has been a running theme overseas. With three days to go and India 292 ahead, it can finally come together for another famous victory.